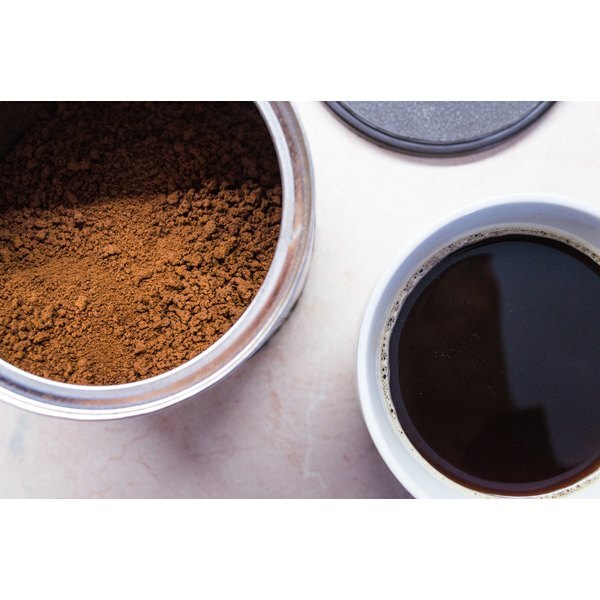 More than half of Americans over the age of 18 consume coffee every day, reports the Harvard School of Public Health, and instant coffee offers a convenient alternative to traditional brews. Portable and easy to prepare, instant coffee also offers a range of health benefits, as long as you prepare it properly. Incorporating instant coffee into your diet can help whittle your waistline. A standard 6-ounce cup of instant coffee, served black, contains a negligible 4 calories. Swapping in coffee for other beverages can help you lose weight. For example, drinking plain instant coffee instead of a cup of orange juice every day would save almost 40,000 calories over the course of a year -- the equivalent of more than 11 pounds. Alternatively, drinking instant coffee instead of a can of cola three times a week would translate to roughly 6.5 pounds lost over the course of a year. Contrary to popular belief, coffee -- including instant coffee -- won't dehydrate you. Caffeine-containing drinks are actually almost as hydrating as plain water, says the University of Florida, so the instant coffee you drink counts toward your total fluid intake levels. Staying hydrated helps maintain a healthy body temperature, plays a role in digestion and even removes waste from your body. Don't rely on instant coffee for all your daily fluid, though -- you still need to drink water. Instant coffee has a leg up on other preparations when it comes to antioxidants. These beneficial chemicals form your body's natural defense against free radicals and keep your DNA and cell membranes free of damage. A study, published in "Food Chemistry" in 2012, found that instant coffee had higher antioxidant activity than coffee made via other brewing methods. These effects decreased when milk was added, however. For optimal health benefits, drink your instant coffee black. That keeps your cup low in calories -- each package of sugar, for instance, contains 12 calories, while a tablespoon of half-and-half adds 20 -- and maintains optimal antioxidant activity. Limit your total coffee intake -- instant or not -- to 2 to 3 cups daily, advises the University of Maryland Medical Center. Any more than that, and you risk consuming too much caffeine, which can cause jitters and disrupt your sleep cycle. If you're also consuming other caffeine-containing foods -- like tea, chocolate or cola -- limit your instant coffee intake even more or switch to decaf.